Look extremely stylish by wearing this pair of capri from the popular brand, Black Panther. It features a solid pattern that renders it smart, while the use of a good quality good quality fabric will provide you with utmost comfort. It also comes with an elastic waistband that makes it convenient to wear. 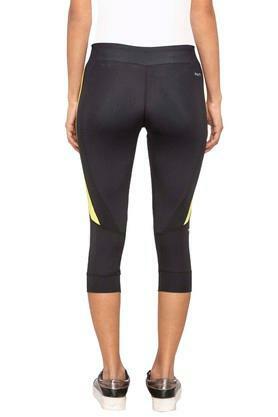 Wear this pair of capri to flaunt your style at the gym. You can wear a t-shirt and a pair of sports shoes with it to make a fashion statement at the work out sessions.